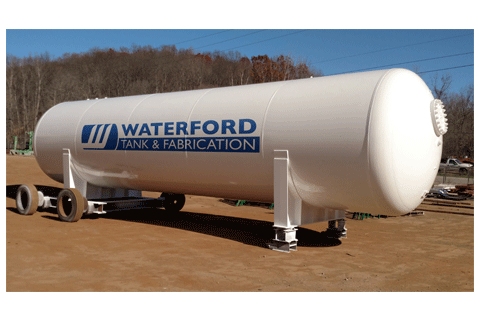 Waterford Tank and Fabrication is certified API 12F and UL 142 that manufactures above ground steel storage tanks up to 1,000 barrels. Our tanks can be manufactured from carbon steel or stainless steel, single wall or double wall, vertical or horizontal and skid mounted. Waterford Tank and Fabrication is certified ASME U and R Stamp, that manufactures pressure vessels and also provide repairs and alterations to your existing pressure vessel. We manufacture 18,000 to 30,000 NGL Bullet Tanks, separators and knockout drums. Waterford Tank and Fabrication also manufacture related accessories for our tanks and vessels; ladders, stairs, platforms, catwalks, crossover stairs, thief hatches and EPRV’s. Waterford Tank and Fabrication custom build for all industrial uses. Certifications: API-12F-0093, API-Q1, ASME U Stamp, ASME R Stamp, UL 142.